In these times of troubling anti-immigrant rhetoric, this cookbook offers a culinary celebration of the many ethnic groups that contribute to a vibrant food culture. Here, 75 chefs each offer a favourite recipe that speaks of where they come from. 75 immigrant chefs each contribute a favourite recipe that speaks of where they come from. In travelling the world and in settling in a new country the influence of these chefs and many others have transformed they way we eat. 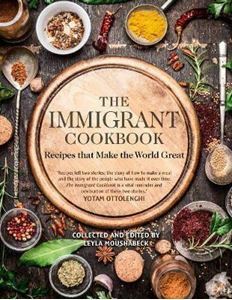 ; In these times of troubling anti-immigrant rhetoric, The Immigrant Cookbook offers a culinary celebration of the many ethnic groups that contribute to a vibrant food culture. This beautifully photographed cookbook features starters, soups, salads, mains, desserts, and side dishes - some familiar favourites, some likely to be new encounters - by immigrant chefs from Africa, Asia, Latin America, the Caribbean, the Middle East, Europe, and Australia. ; Chefs include bestselling authors such as Barbara Abdeni Massaad, author/compiler of Soup for Syria: Recipes to Celebrate Our Shared Humanity.